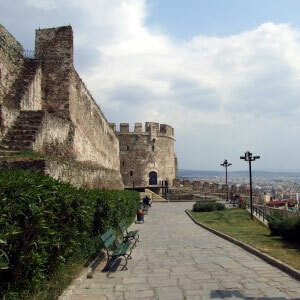 The church of Prophet Elias is a very important monument for the city of Thessaloniki since is the only church in Thessaloniki which was constructed with the technique used by the Palaeologus family. Its architectural design is cross shaped with four-columns, known as the Athoniki technique since it was used exclusively in the holly Mount of Athos. The church was built on a hill overlooking the city, in the 14th century and is located at the intersection of Olympiados and the Prophet Elias streets, in the Upper city. 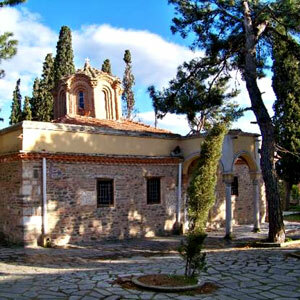 Originally thought to belong to the Monastery of Nea Moni, but later identified as the monastery of Akarnios. in 1430, during the Ottoman occupation, the church of Prophet Elias, converted into a mosque and all its frescoes were almost destroyed. Today very few frescoes exist, at the inner church.